Big Bend National Park is a land of borders. Situated on the boundary with Mexico along the Rio Grande, it's a place where countries and cultures meet. It's also a place that merges natural environments from desert to mountains, where south meets north, and east meets west, creating a great diversity of plant and animal life. The park offers a fascinating look into the lives of early pioneers, ranchers, miners, Native Americans, and the area's border culture. 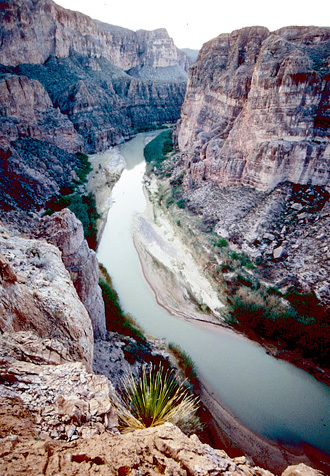 The park covers over 801,000 acres of west Texas where the Rio Grande makes a sharp turn — the Big Bend. The author Fredrick Gelbach describes these borderlands aptly when he calls them “a carpet of interacting plants and animals deftly woven on a geologic loom.” Gelbach conjures up images of looming mountains, stark desert landscapes, and a ribbon of water slicing through it all. 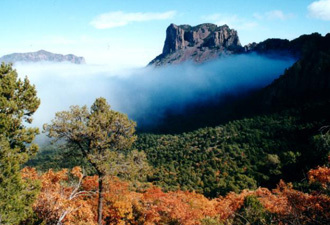 Indeed, this is what Big Bend and the surrounding area is — a varied natural area of river, desert, and mountains. To wander the shimmering desert flats, to ascend the rimrocks of the desert mountains, to float the canyons of the Rio Grande — to be “on the border” — is to experience sights and sounds and solitude unmatched elsewhere. It's said that if the Chisos Mountains are the heart of Big Bend, then the desert floor is its soul. Ninety-eight percent of the park is desert, and like the mountains, the desert is a land of contrasts — a place where you can touch 400 million-year-old rocks with one hand and a day-old flower with the other. Big Bend's desert landscape itself is a study in diversity — mesas, mountains, and dikes formed by volcanic activity, limestone ridges and cliffs formed 100-200 million years ago. The one place where you can count on seeing water in Big Bend is along the Rio Grande — an oasis that's been called the lifeblood of Big Bend. To drift on a river trip through the majestic canyons of the Rio Grande with your oars touching two countries at the same time is to span time and space. As you float with the current, you may see both the expected and the unexpected — the black phoebe flitting to and fro, a turtle — a Big Bend slider, perhaps — perched on a rock slipping with a quiet “plop” into the water, tiny swallows darting into their mud-nest “apartments,” or a Peregrine falcon swooping to its prey. At night, the display of stars connecting you to other parts of the universe is breathtaking. Big Bend provides outlets to escape to a solitude seldom found in daily life — a chance to experience unfamiliar creatures and plants, an endless expanse of stark desert and mountain scenery, and the vast space, heat, and silence that is the essence of the desert. 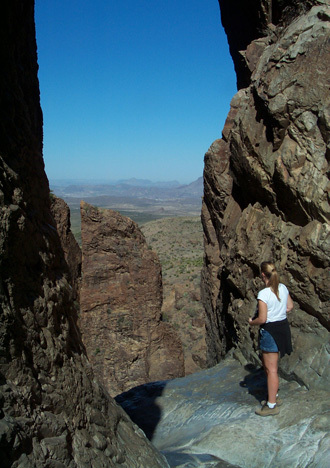 Big Bend offers opportunities for recreation such as backpacking, driving dirt roads, hiking, bird and animal watching, river running, camping, and ranger programs. This land is vast, wild, and part of the last frontier. Find out more at http://www.nps.gov/bibe/index.htm.